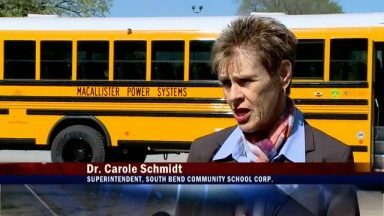 WNDU – Channel 16 based in South Bend, IN has reported that the South Bend Community School Corporation is considering the purchase of propane-fueled school buses manufactured by Blue Bird and sold by MacAllister Power Systems. In the report, WNDU states that because propane-fueled buses are more efficient, the School Corporation estimates an energy savings of $38,735 over the typical 12-year life span of a school bus. A full return on the additional investment over the cost of a traditional diesel-fueled bus would be realized in about two and a half years.